For 4/4 Violin. Tweed-Look Exterior Finish - 3 Layer Construction: AIREX, ABS and PVC for Exceptional Protection - Protective Anti-Skid Rubber Guards - Neoprene Shoulder Strap - Super-Light Weighing Only 3.5lbs - Instrument Suspension - Black Plush Interior - Foam Instrument Suspension Cushions - Two Bow Holders - Zippered Accessory Pouch. 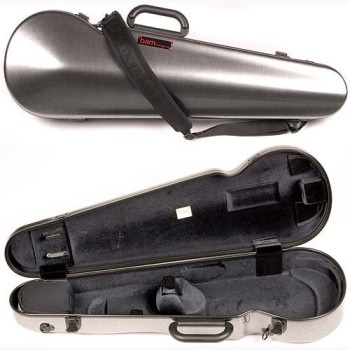 An airtight seal makes this case extremely shock and pressure resistant for the ultimate in violin protection! Actual outside/inside color may vary, please inquire.